Summer is finally here and we have June's Visiting Teaching Gift ready to go so you can get those visits done without any extra work on your part. The message from the Ensign is entitled, "Temple Ordinances and Covenants" and we loved one of the phrases so much we decided to put it on the front of our gift! It says "The Source is God. Our access to that power is through our covenants with Him." Includes approximately 1/3 lb of sanded lemon drops along with the full message from the June Ensign. Enjoy! We've taken a box of Kool Aid popsicles and made a darling cover tag that says, "By following our Mentor, Heavenly Father, we can receive aid throughout our lives." The message from the June 2016 Ensign is included in this gift! Our June Visiting Teaching Gift is filled to the brim with cuteness! 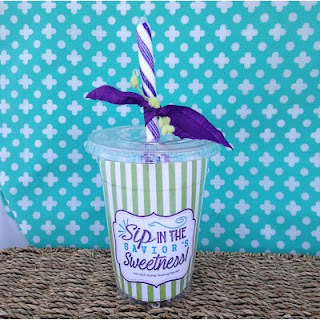 You will get a clear plastic cup filled with the message from the Ensign, a handful of opalescent frizzies, two flavored drink packets (ready to mix into water), a huckleberry candy stick, and of course ribbon and a little handmade love mixed in. We invite all sisters to "Sip in the Savior's Sweetness" as they read about another one of His divine attributes. Our June Home Teaching Gift will not only make your job a little easier - you'll look good doing it, too! We've taken a theatre sized box of Good and Plenty's, wrapped it in a lime green chevron printed bag, added the message from the Ensign, and a tag that says, "Building GOOD relationships with your family will bring PLENTY of Eternal Blessings." 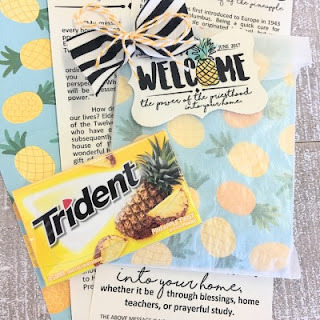 The message from the Ensign is titled, "Families Can Be Together Forever"
Summer is here and the June Visiting Teaching gift is bright and sunny to fit the season. 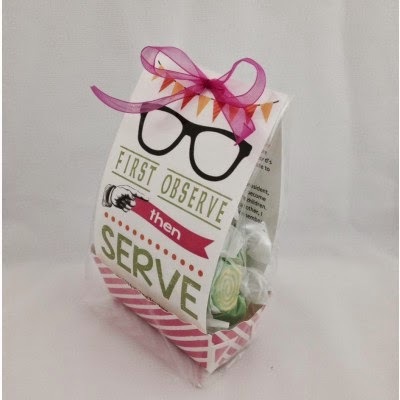 We have used the quote, "First observe, then Serve," as the main focus of our gift. The message is entitled, "The Diving Mission of Jesus Christ: Minister" and there are some great quotes and thoughts about following Christ's example in serving others. Included is a mini hot pink striped box filled with lemon-lime/banana flavored salt water taffy. The handout is double sided with the full message from the Ensign printed on the inside. We hope you enjoy giving these darling gifts to the sisters in your ward. The First Presidency message for Home Teaching for June is entitled, "Hastening the Work" and is by President Thomas S. Monson.